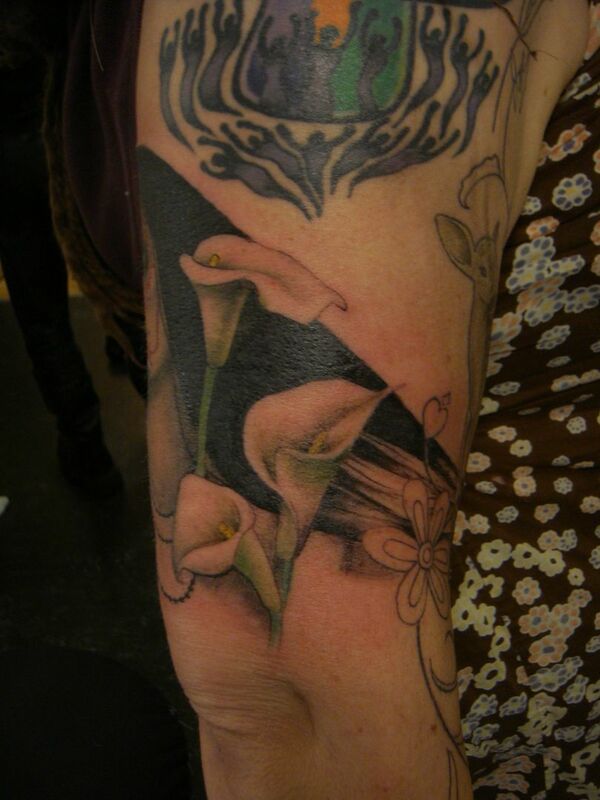 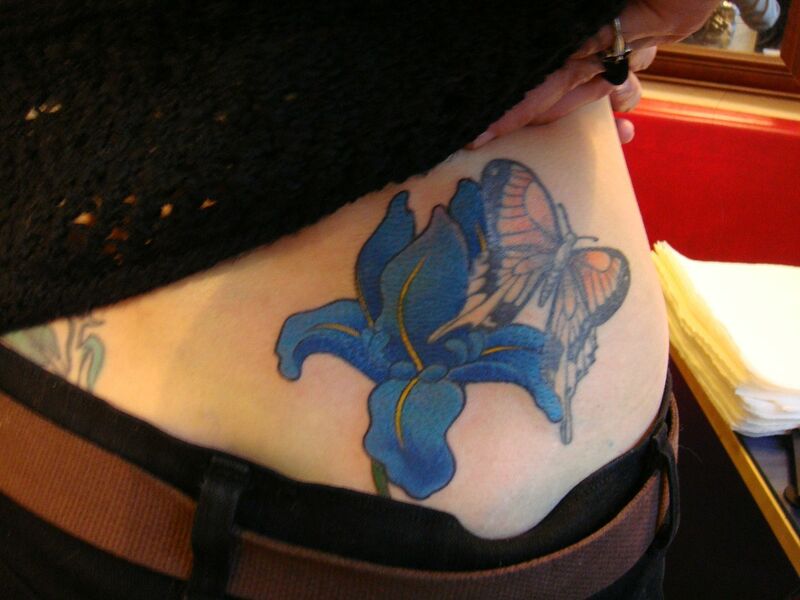 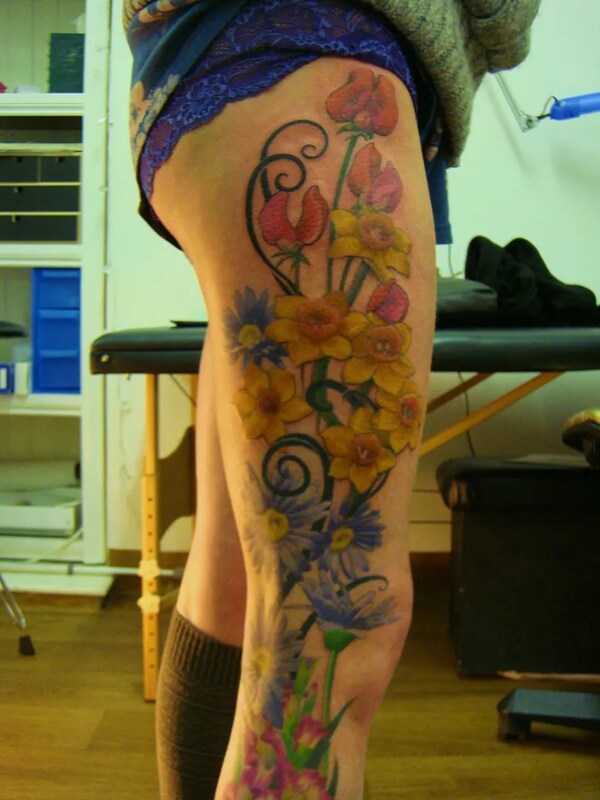 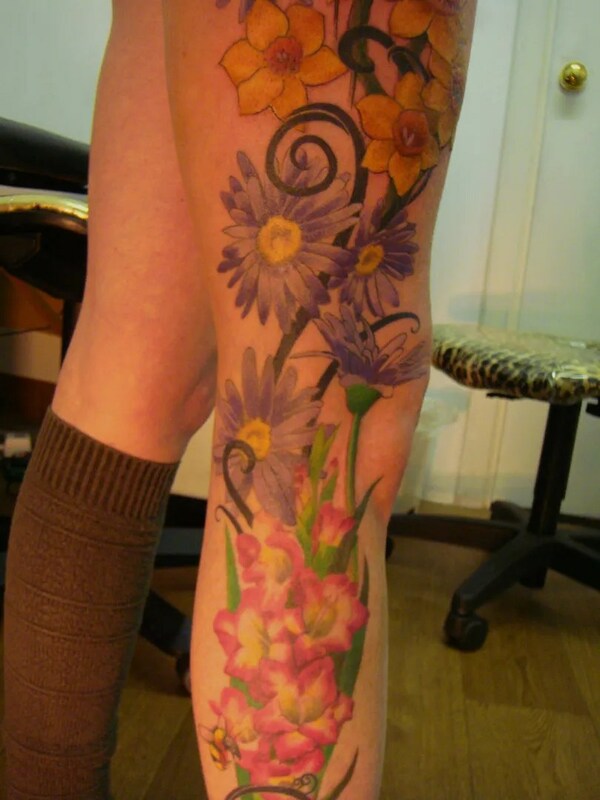 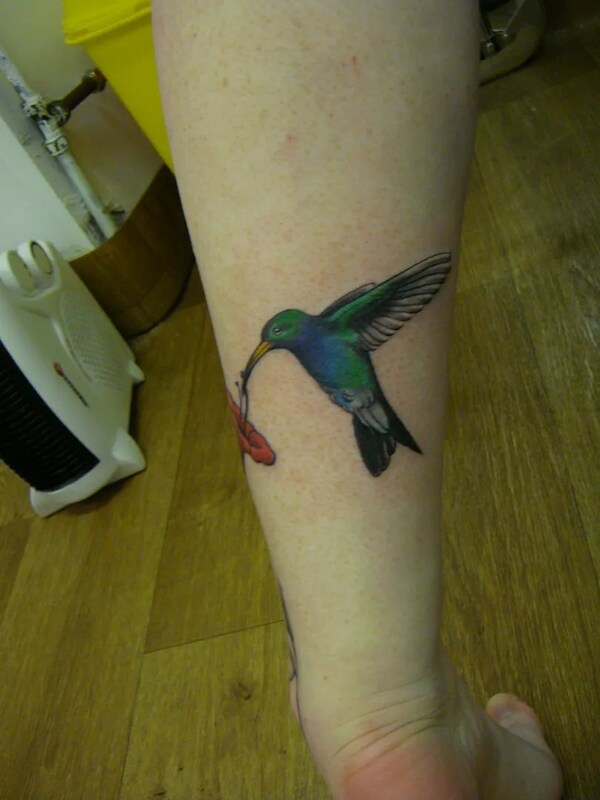 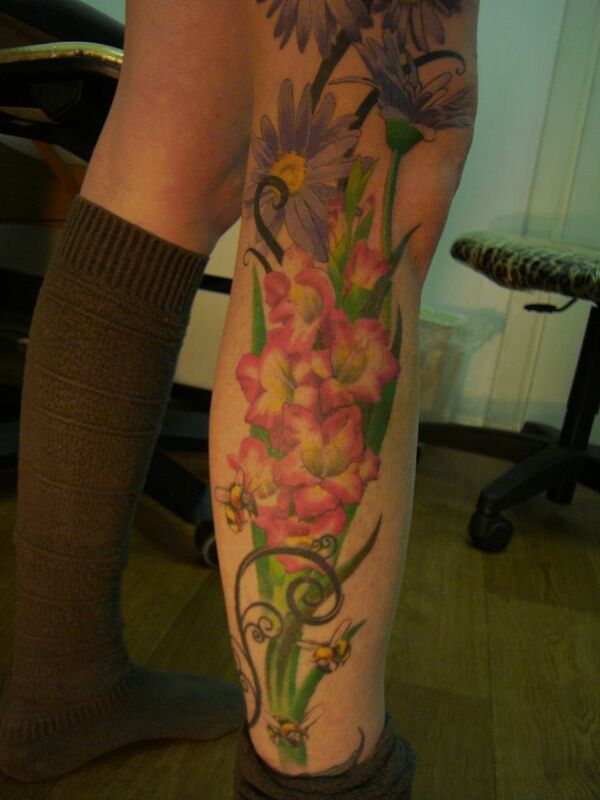 and speaking of colour, melissa got some sweetpea flowers added to her collection! 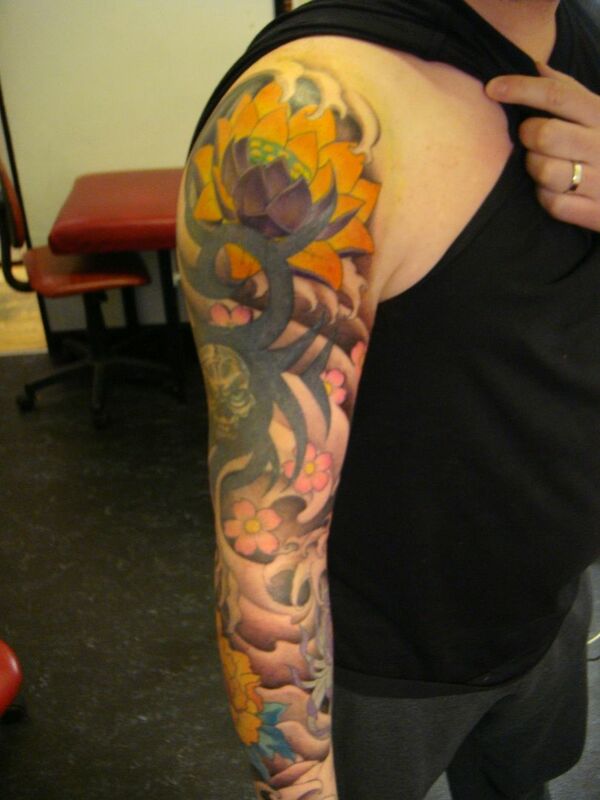 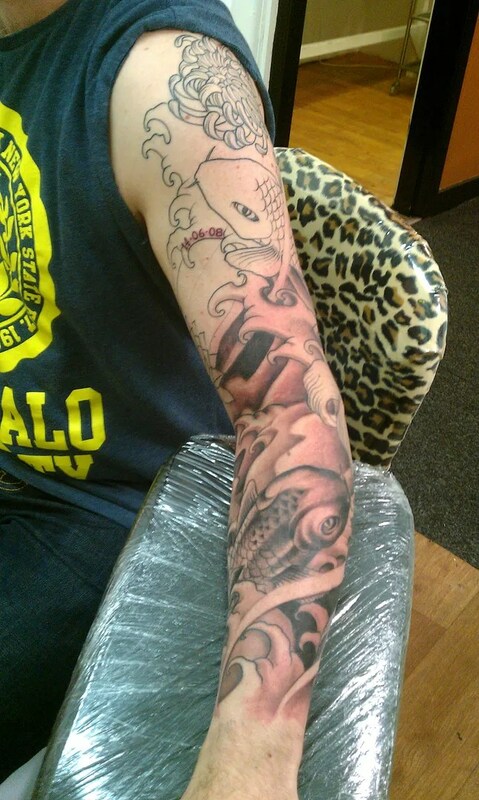 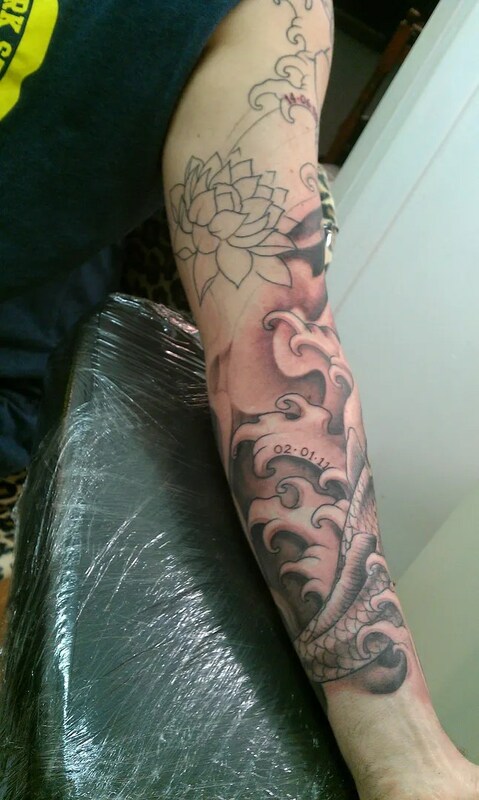 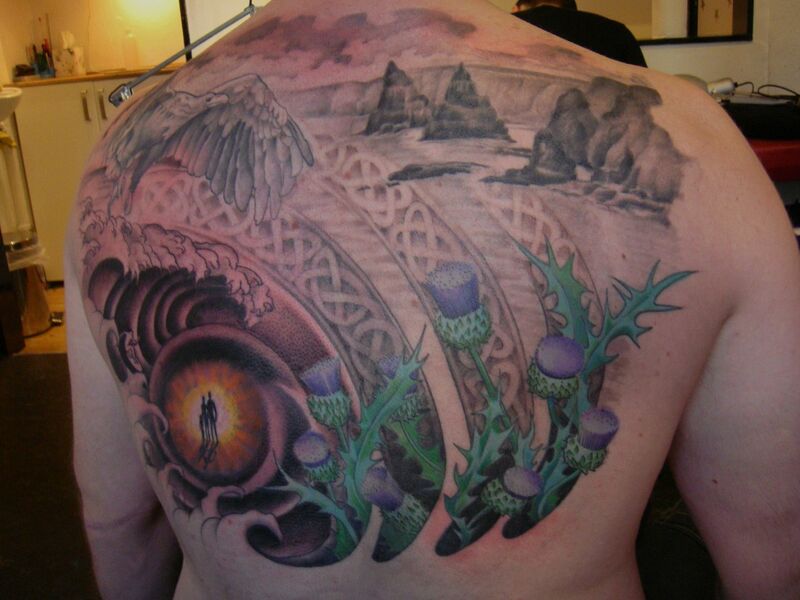 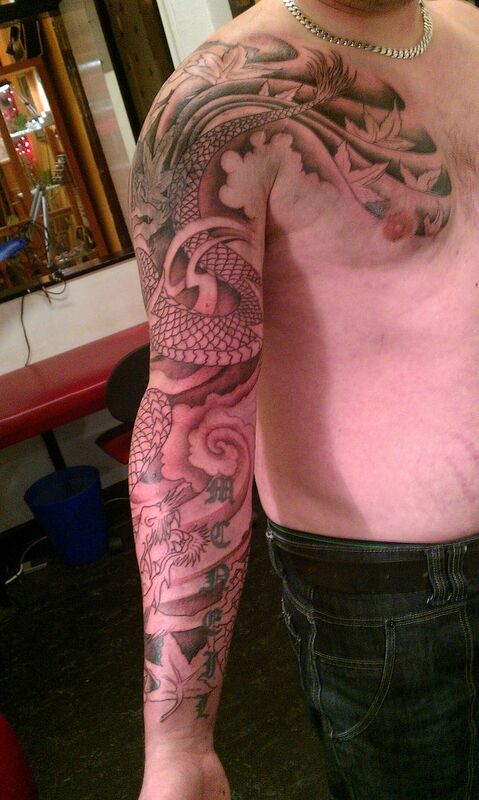 Ross was in for a whole day of tattooing, we did 7 and a half hours of work, and a half hour for lunch. 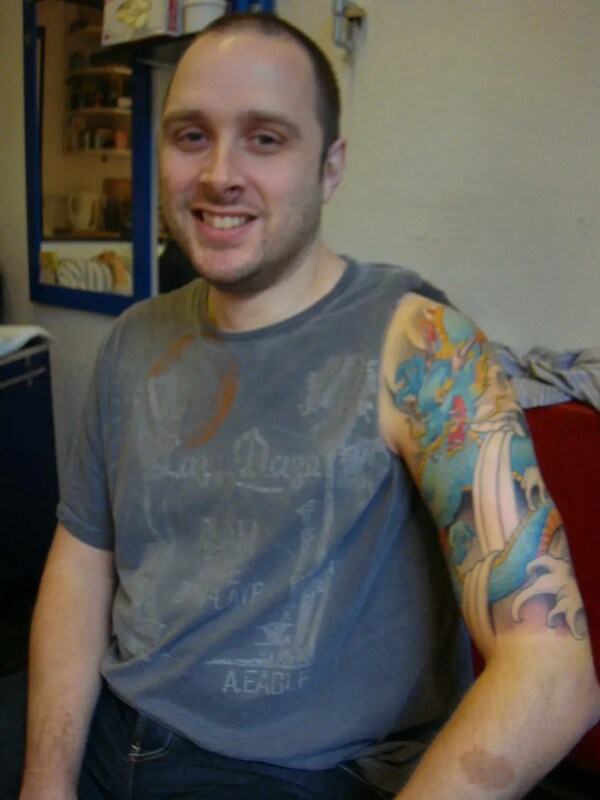 I’m relentless when I get going, as some of you may know… the poor guy was done in by the end of it, we called a taxi to take him to the train station, and I was concerned for him- hope he’s ok! 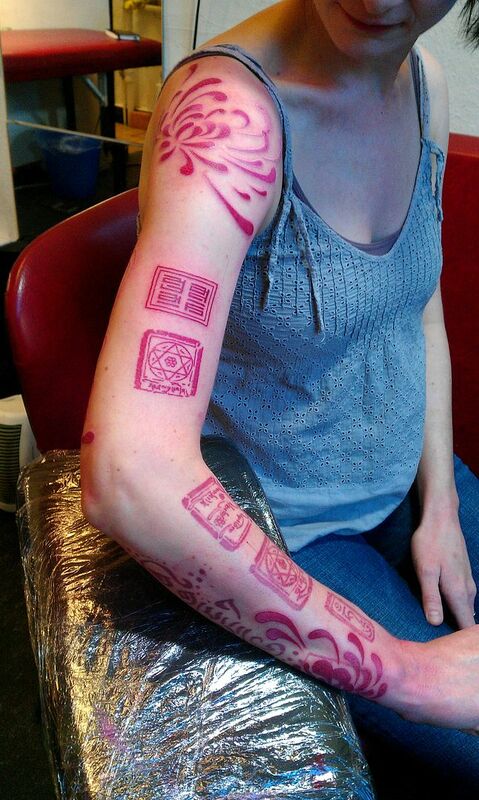 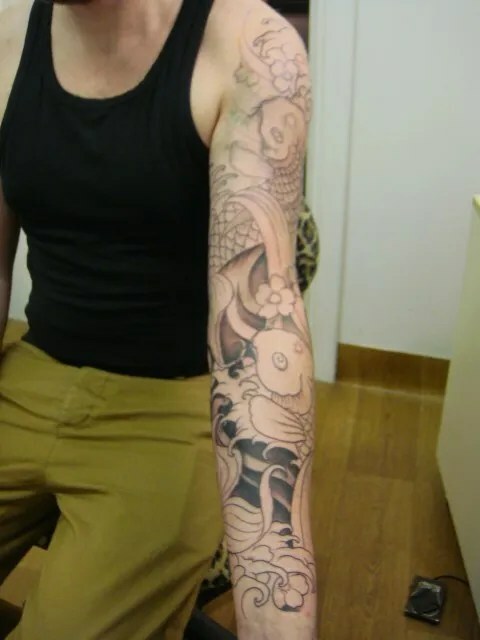 Roz had lasered an old tribal piece on his upper arm, and that helped a lot, although there are still some spots that could benefit from being lightened a bit more. 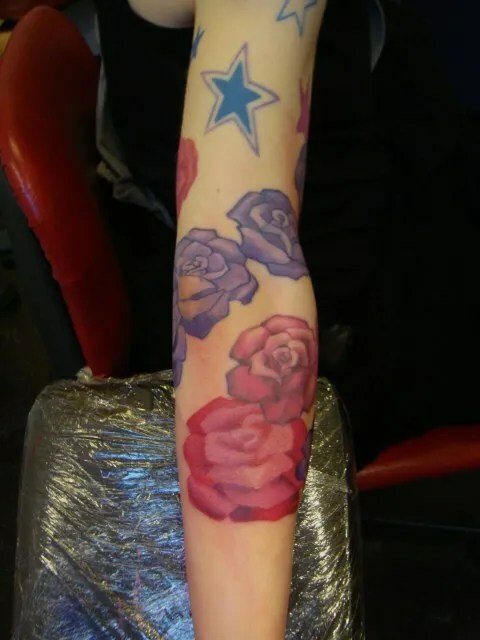 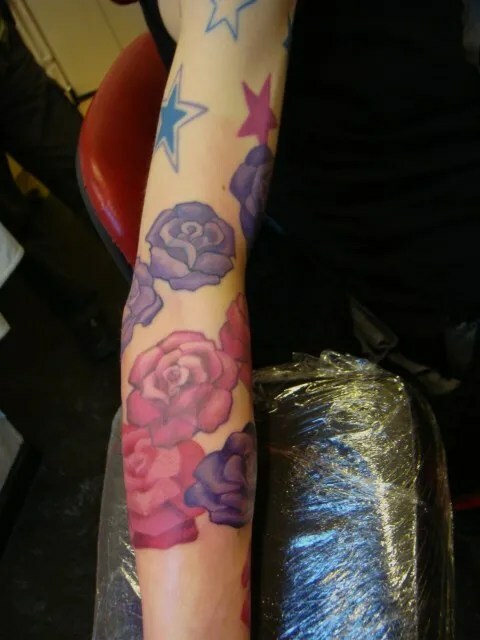 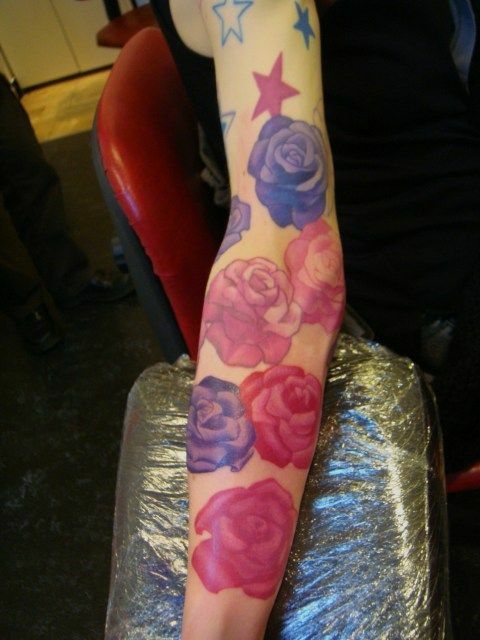 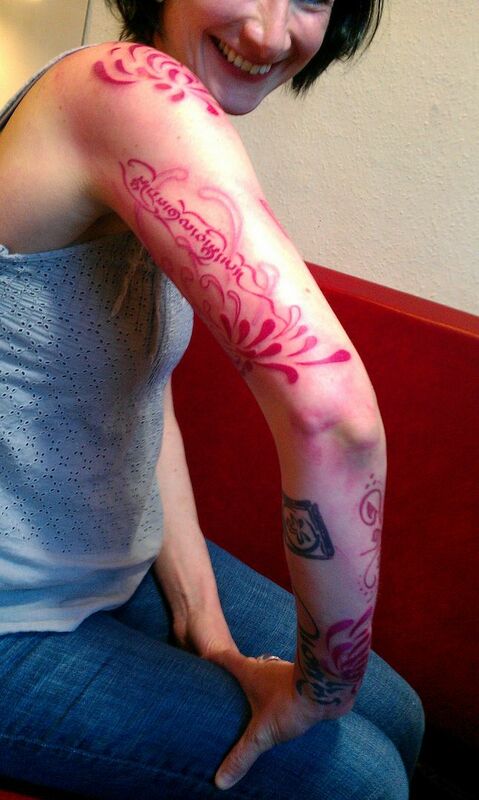 The laser treatment can run concurrently to the tattooing, now that I’ve oputlined the bits that I intend to keep dark, Roz can tackle the gaps and any bits I want lightened to put colour over. 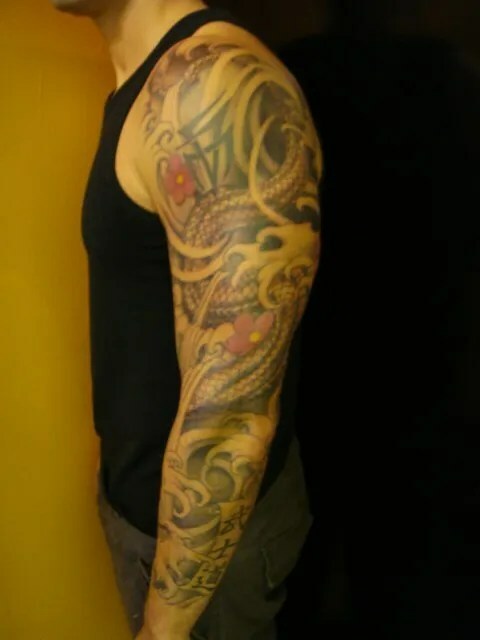 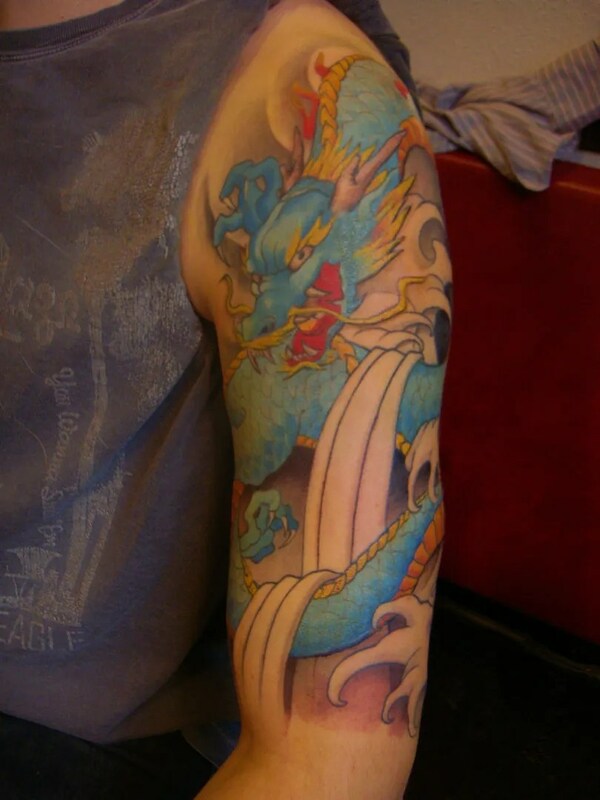 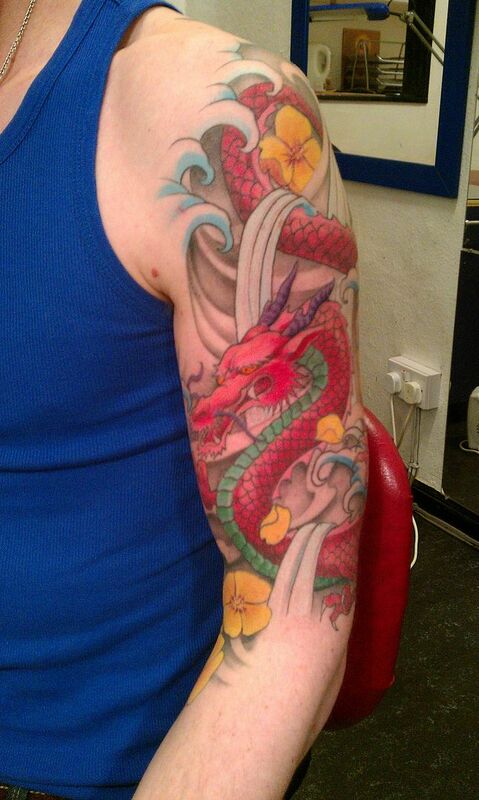 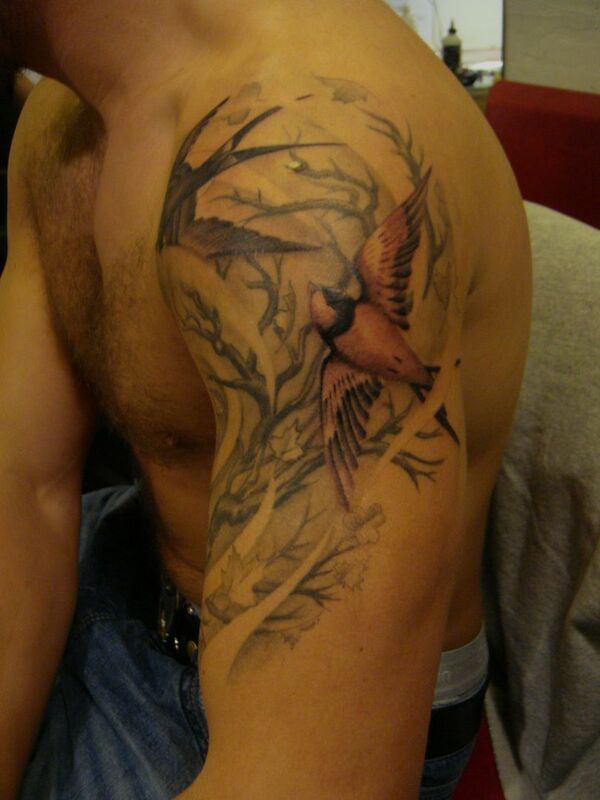 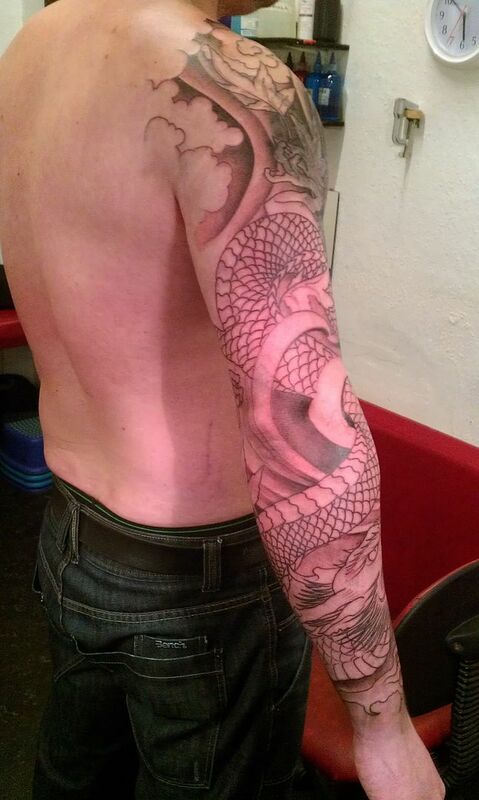 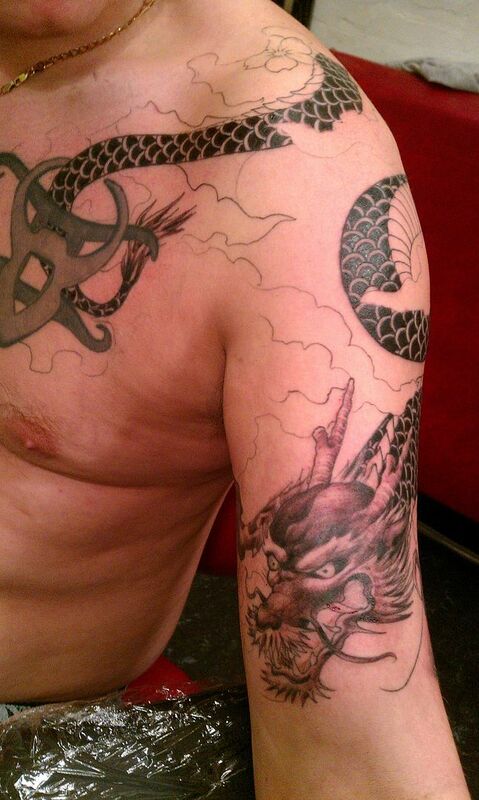 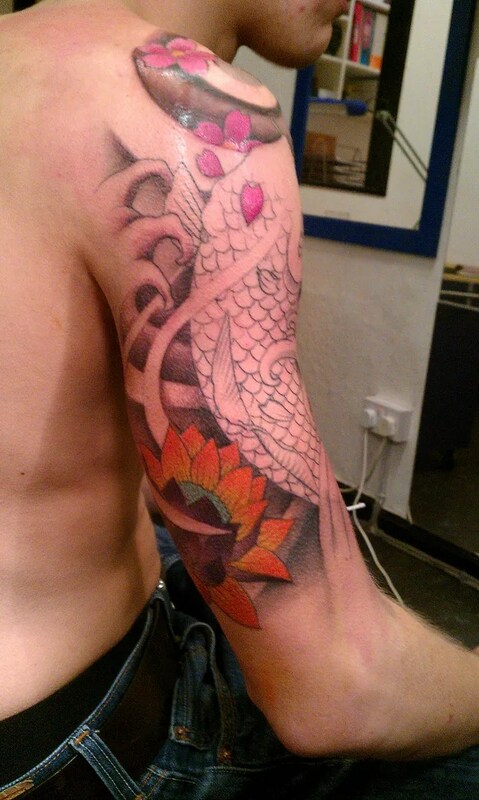 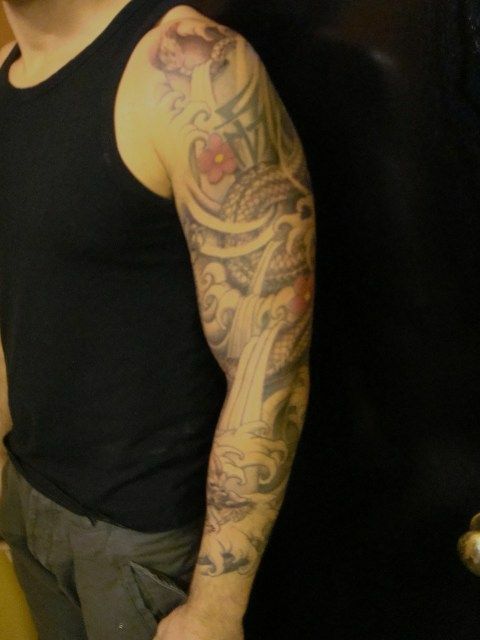 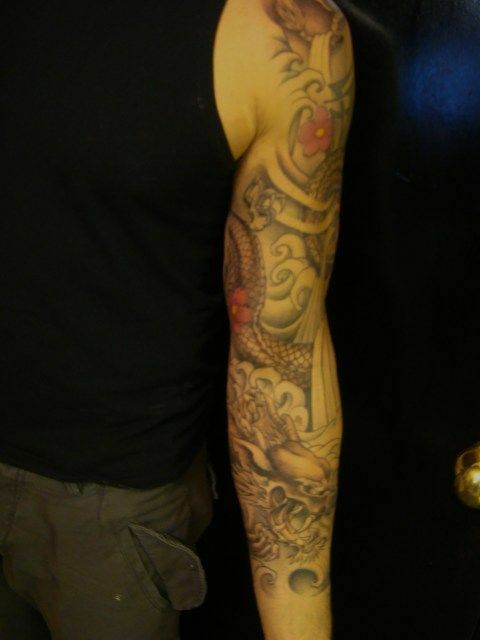 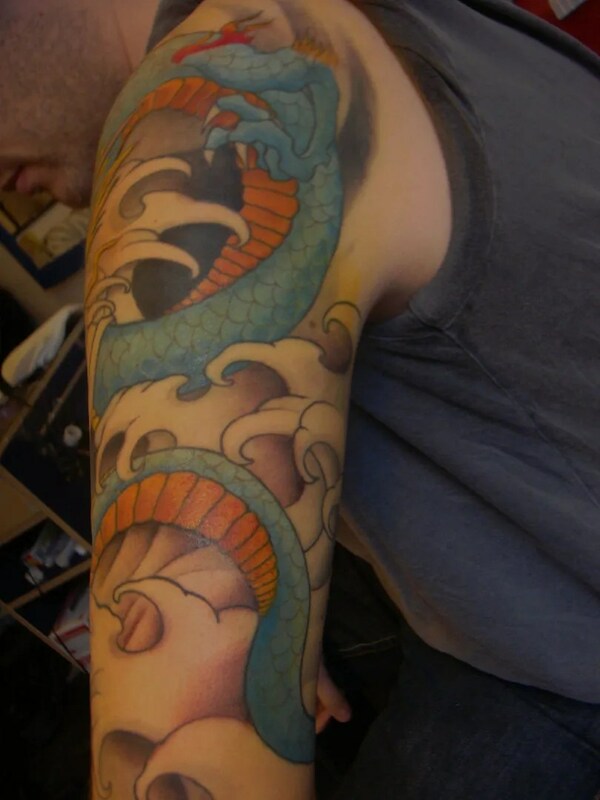 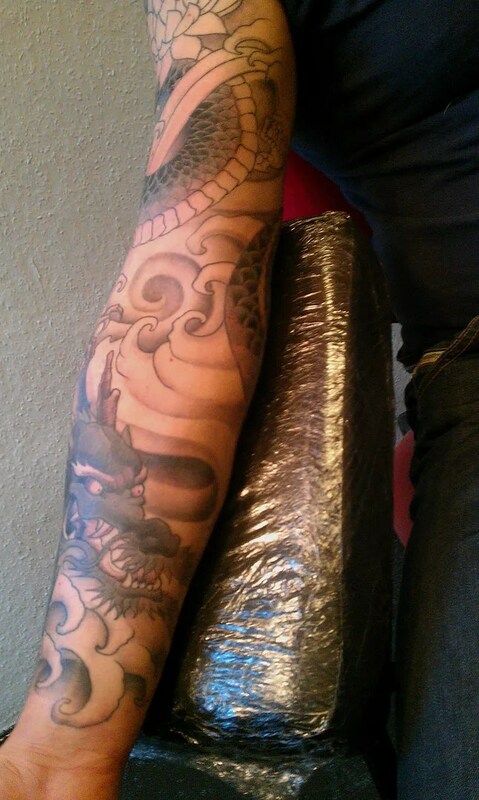 Ross wanted a dragon sleeve, coming onto his chest. that was all he knew, he’d read this blog of mine and knew that I would do something he liked, so he gave me a free reign. 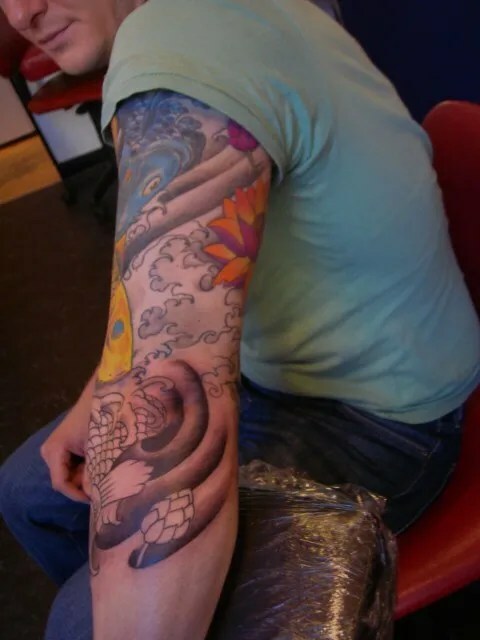 I looked out the window and decided to go for lots of wind and some autumn leaves being blown about by a lot of movement. 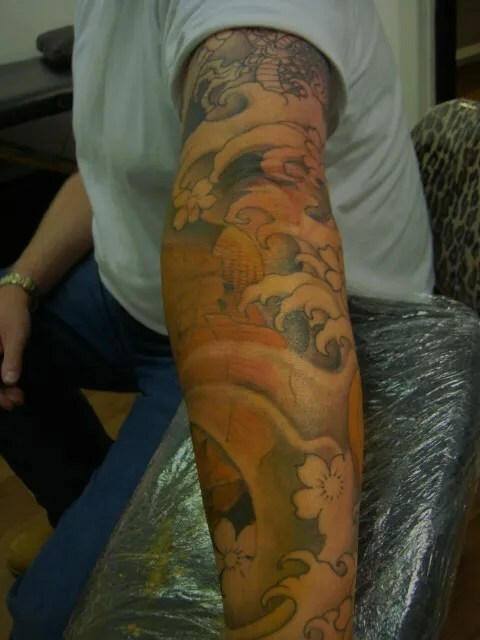 When left to my own devices I usually go for just a few key ‘ingredients’ and let the movement of the body dictate how the tattoo looks. 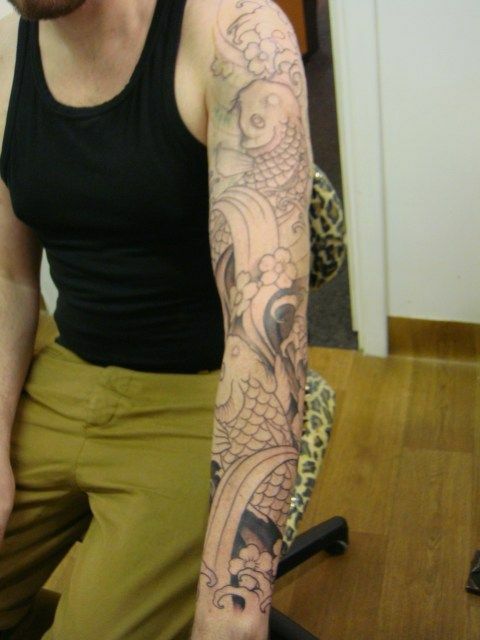 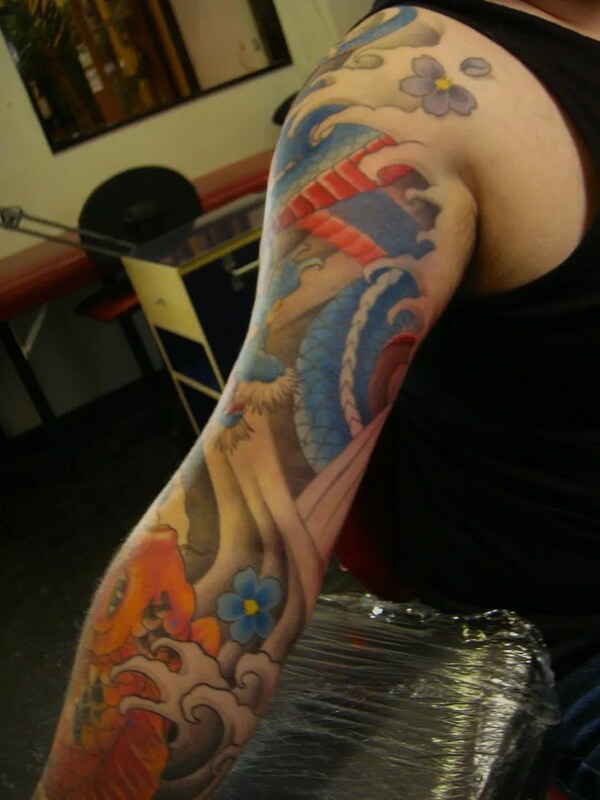 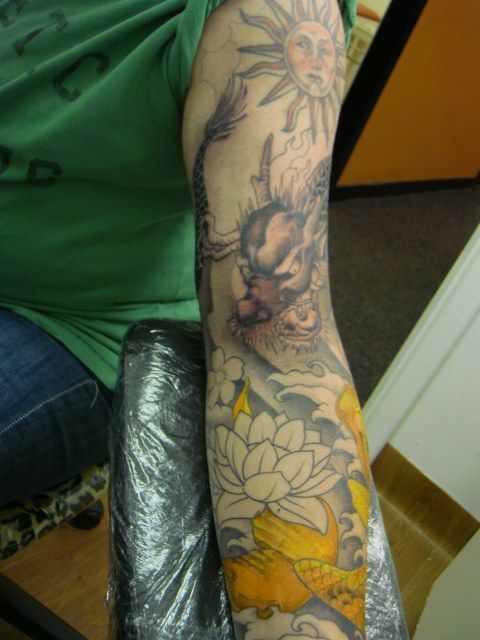 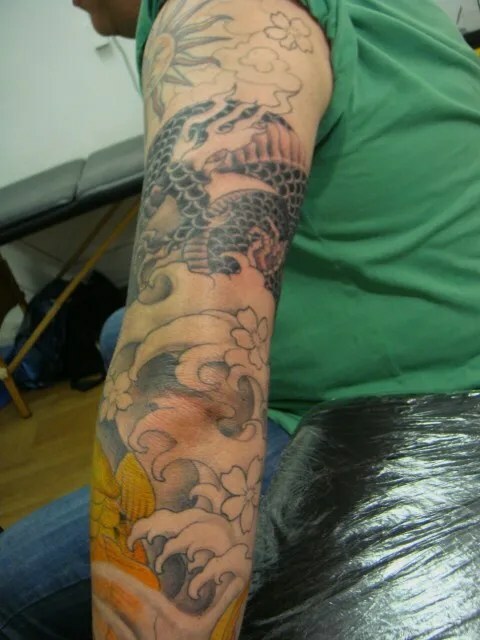 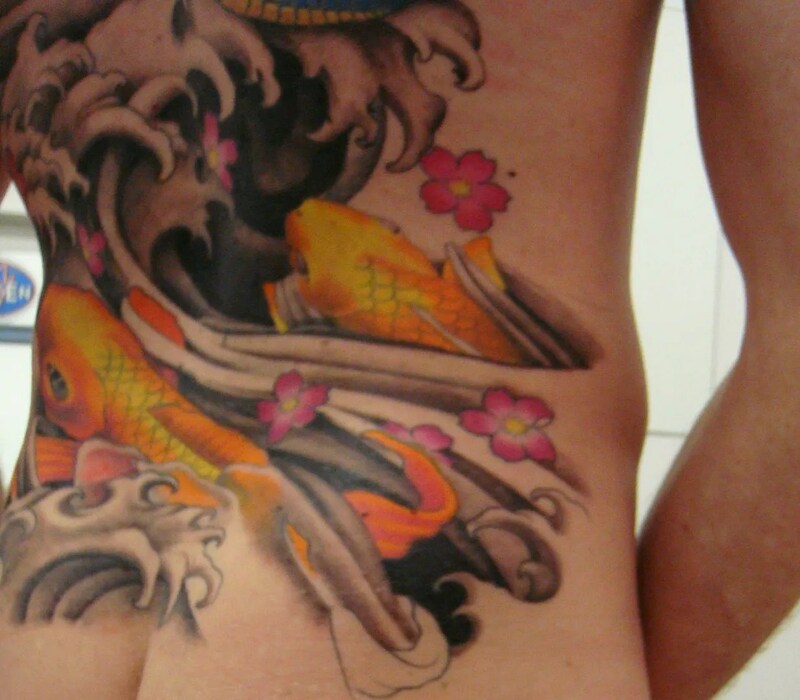 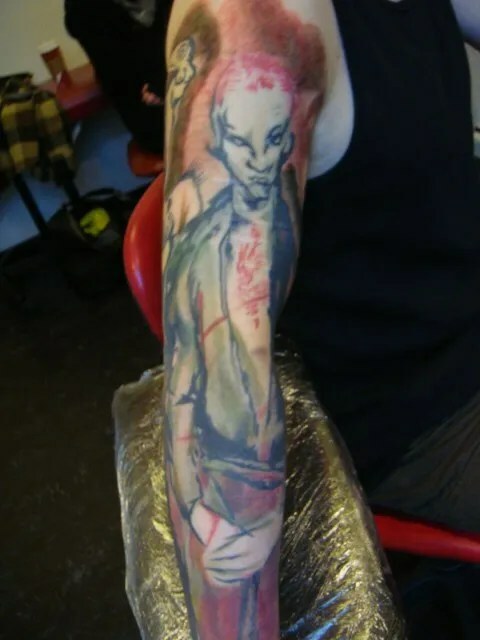 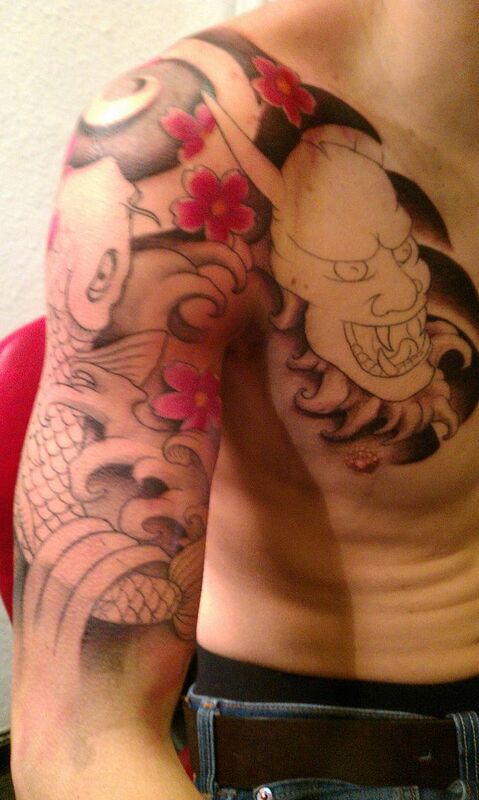 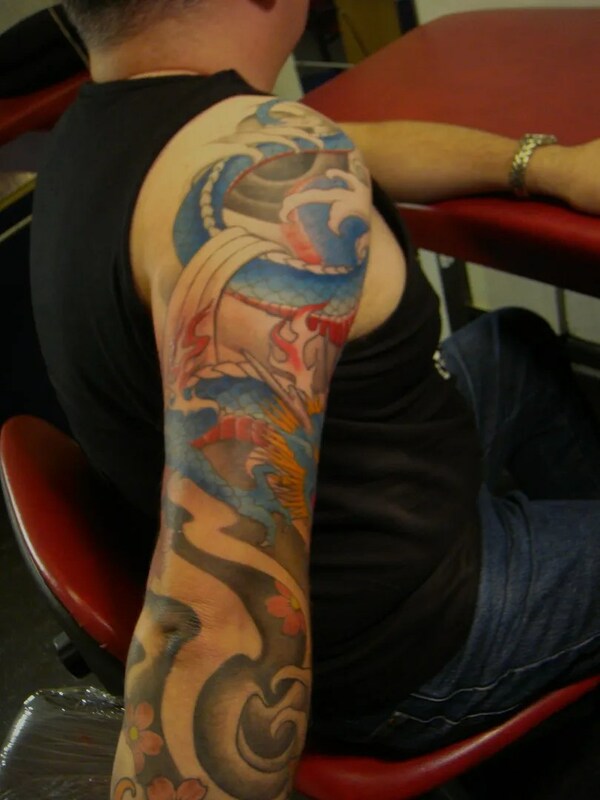 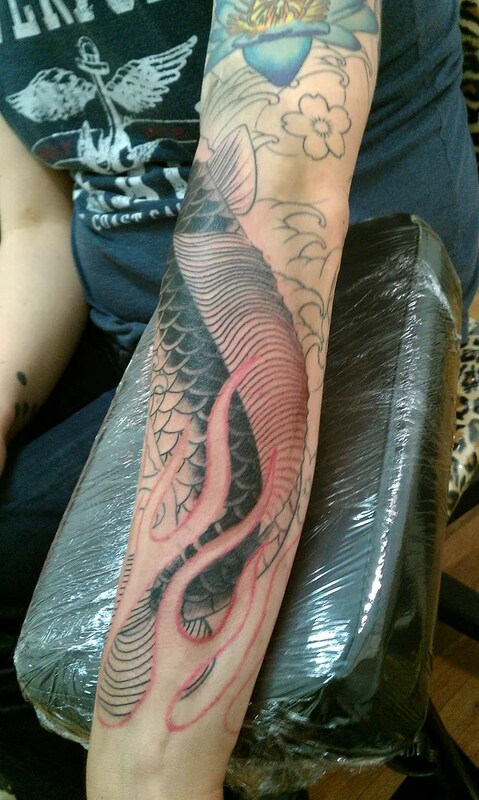 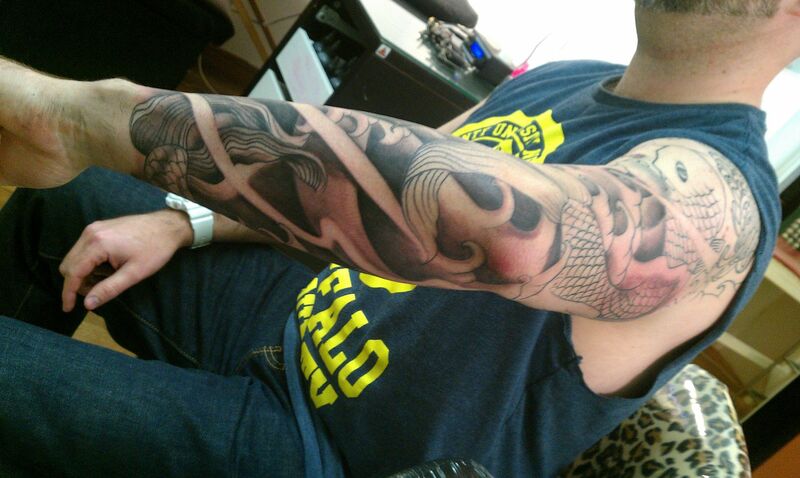 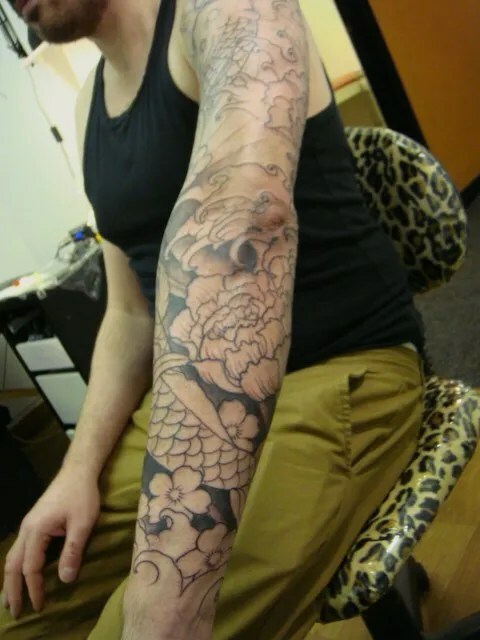 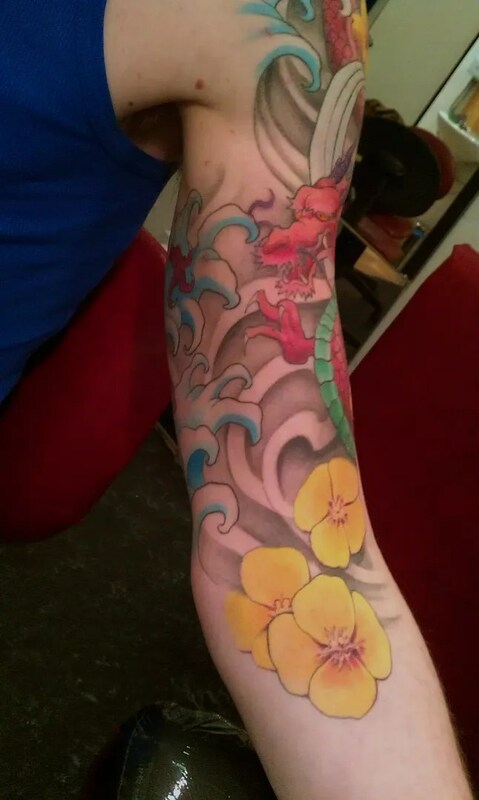 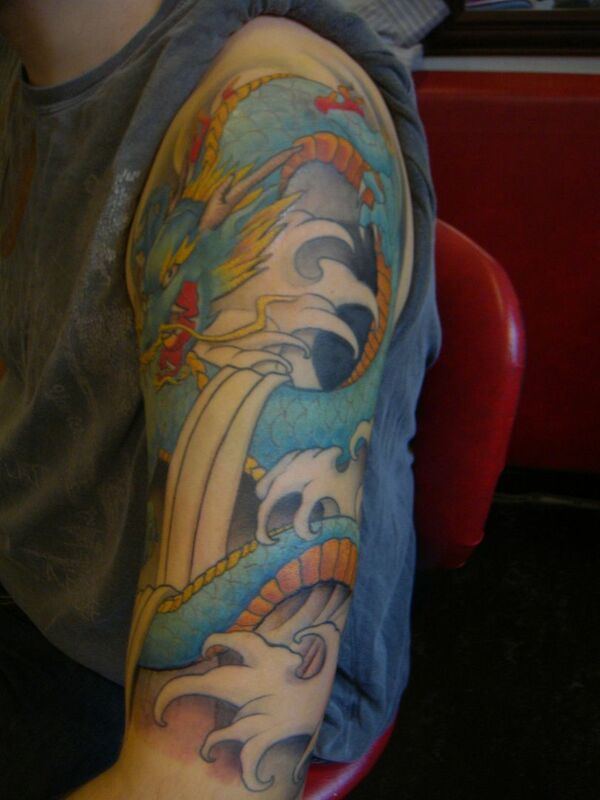 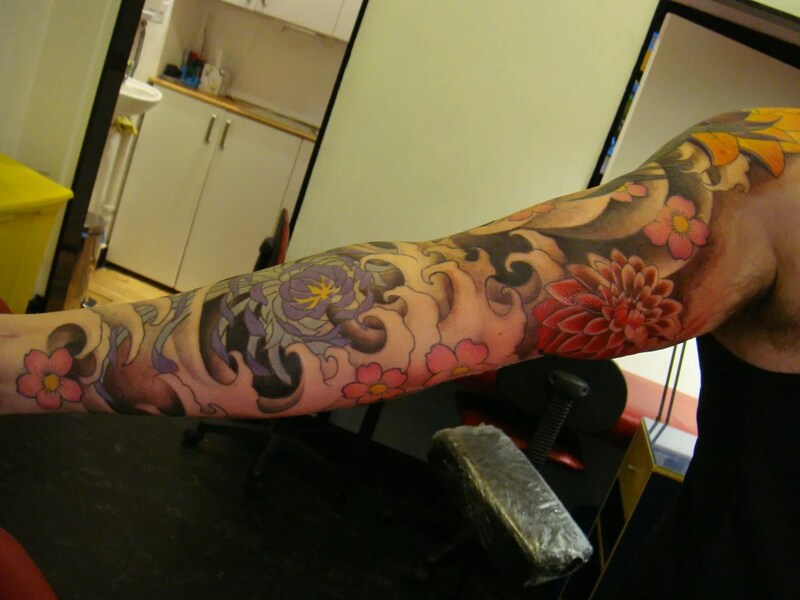 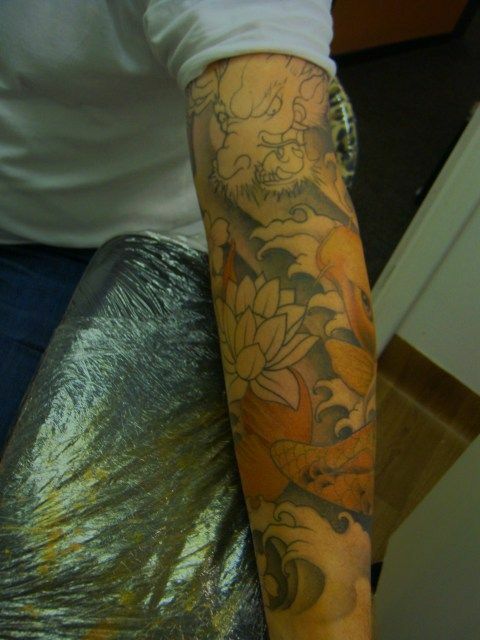 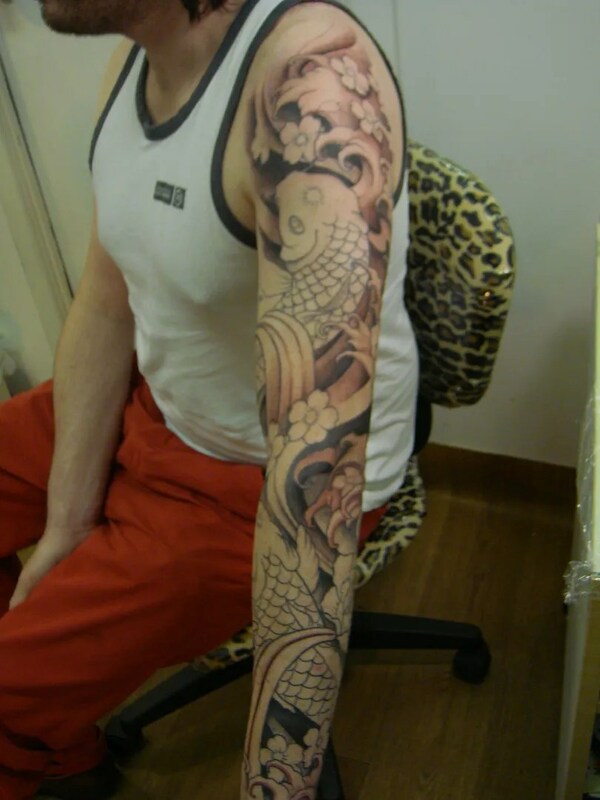 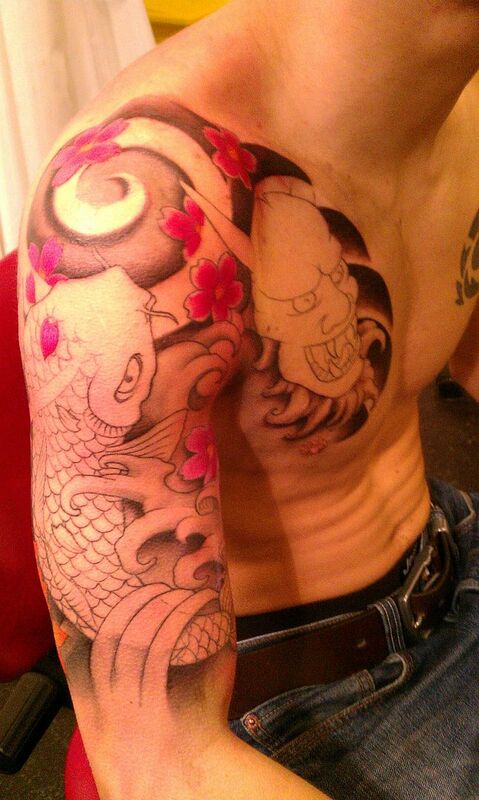 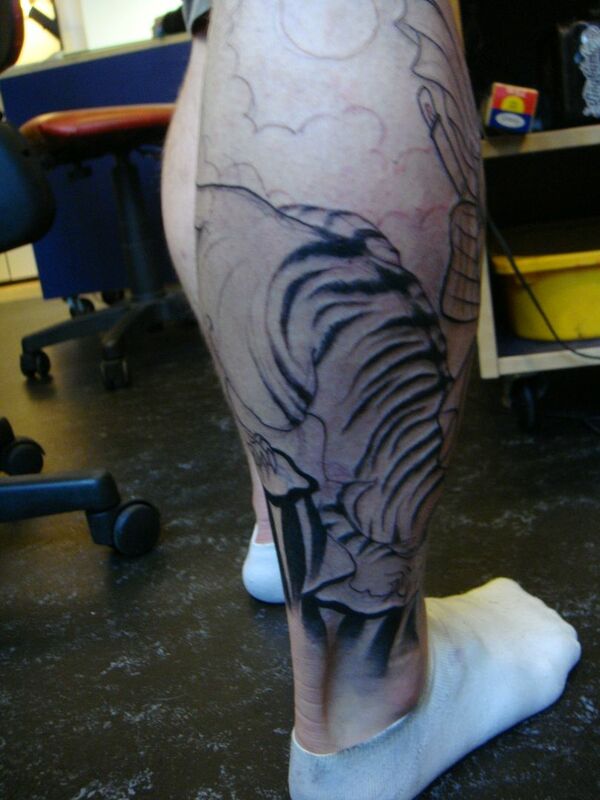 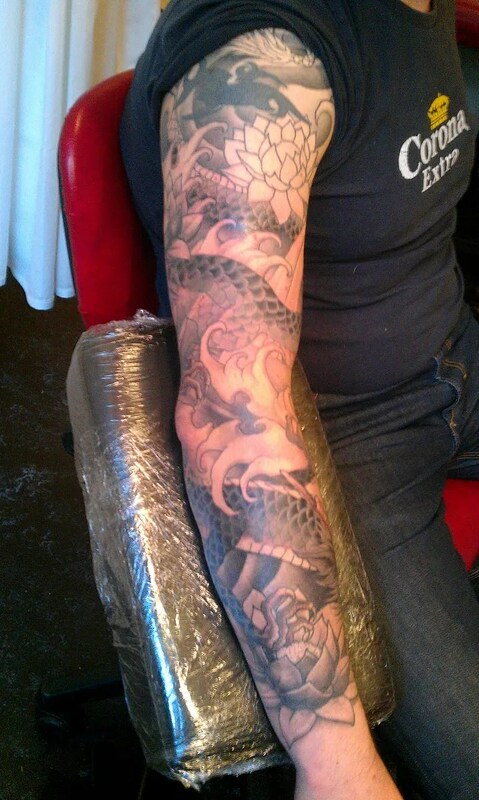 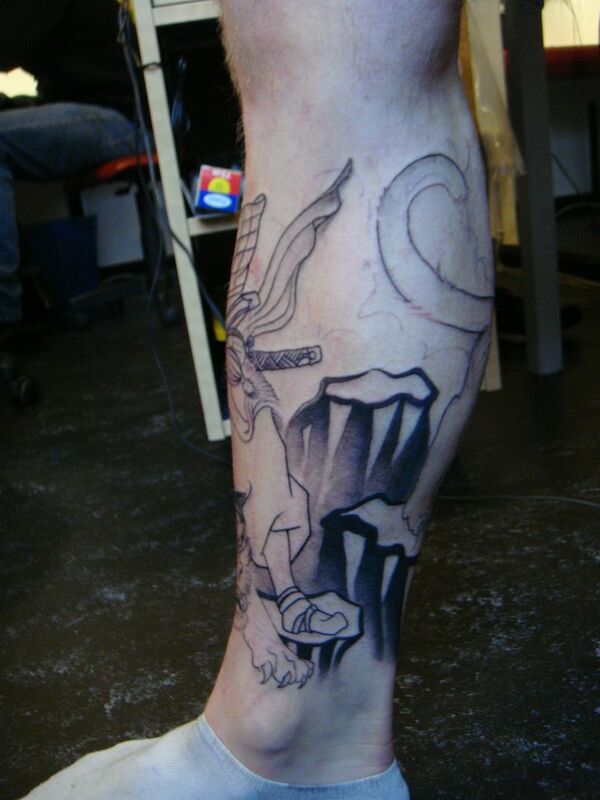 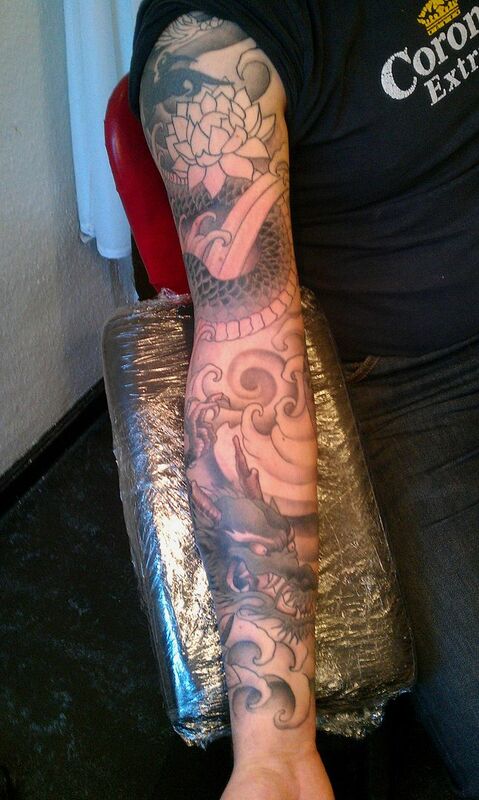 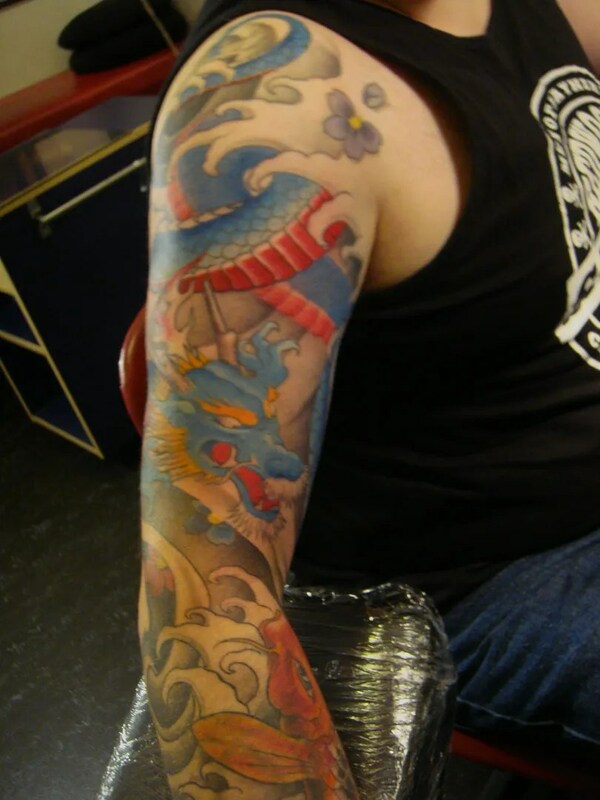 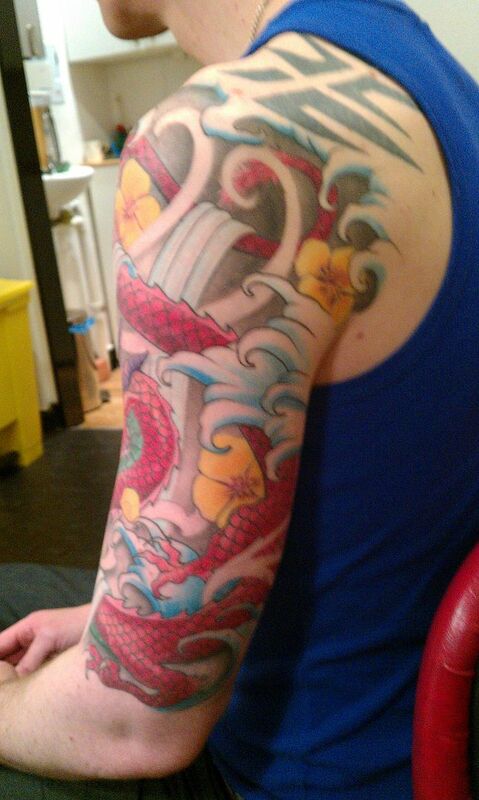 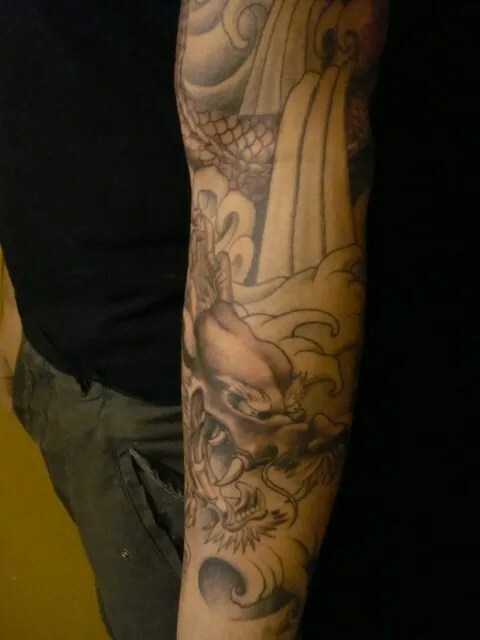 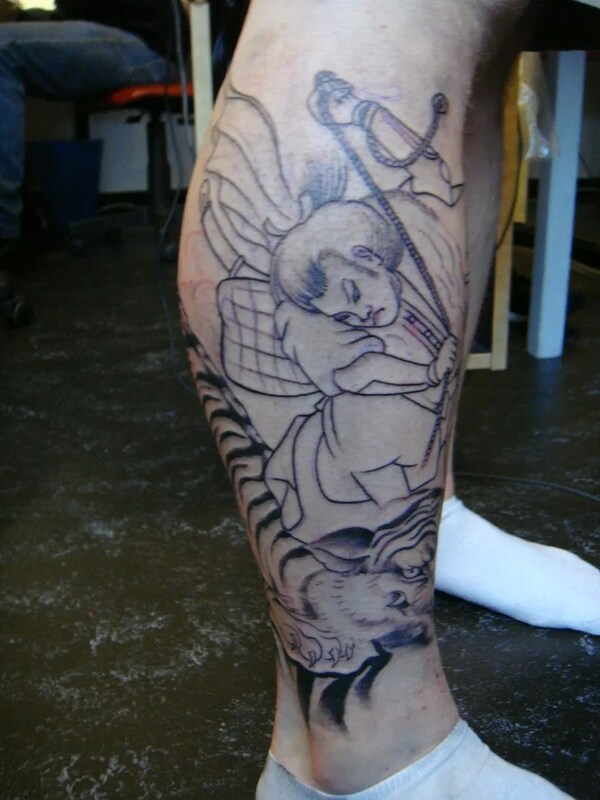 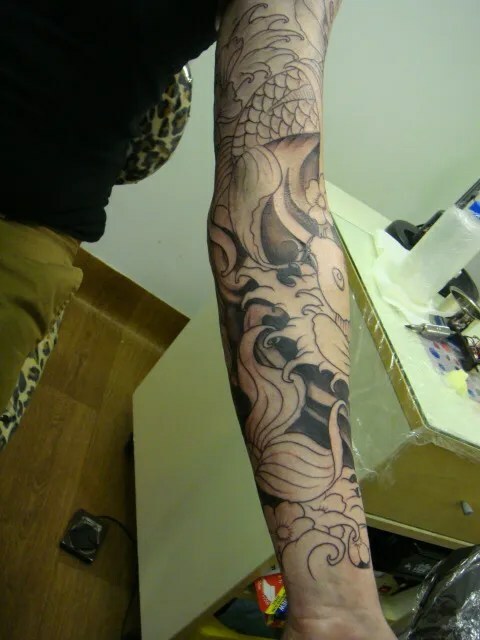 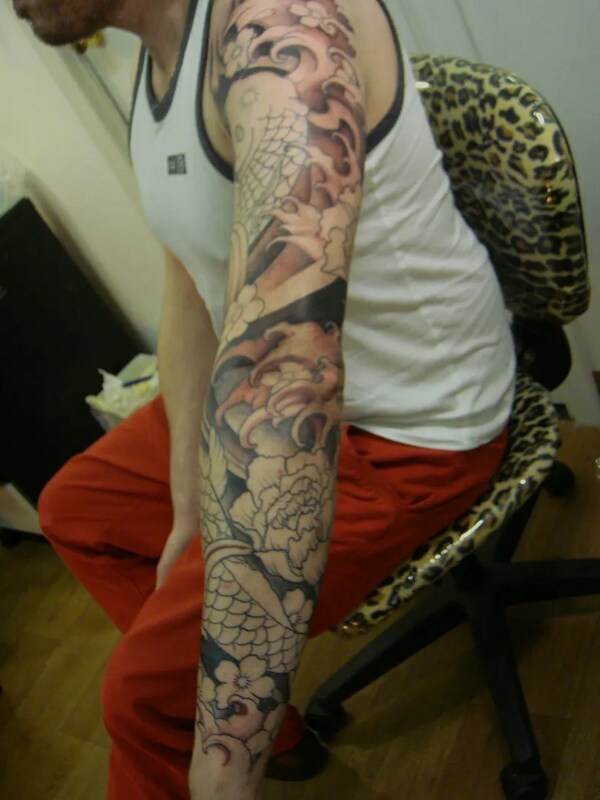 the next day I started another new piece, David wanted a japanese warrior with a white tiger. 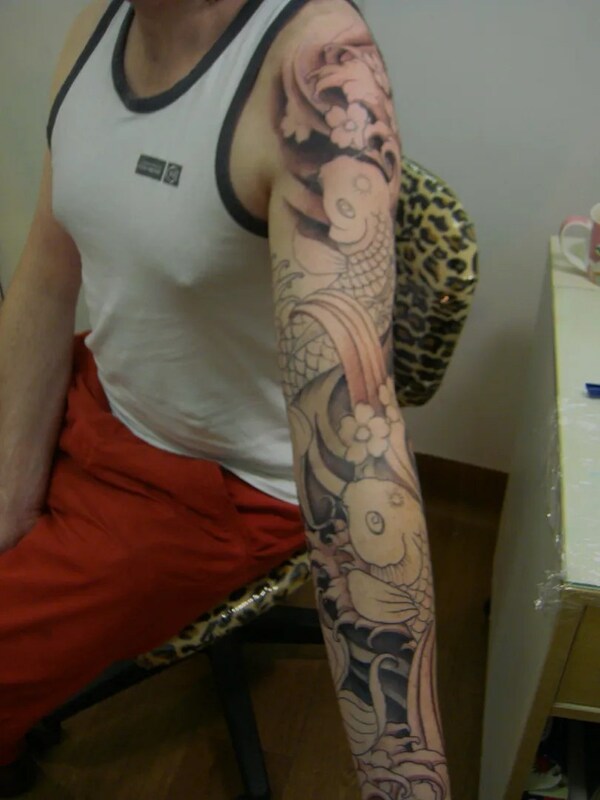 As usual for me, I leave the japanese warriors and their complicated outfits to the experts, I use one of Horiyoshi’s beautiful drawings. 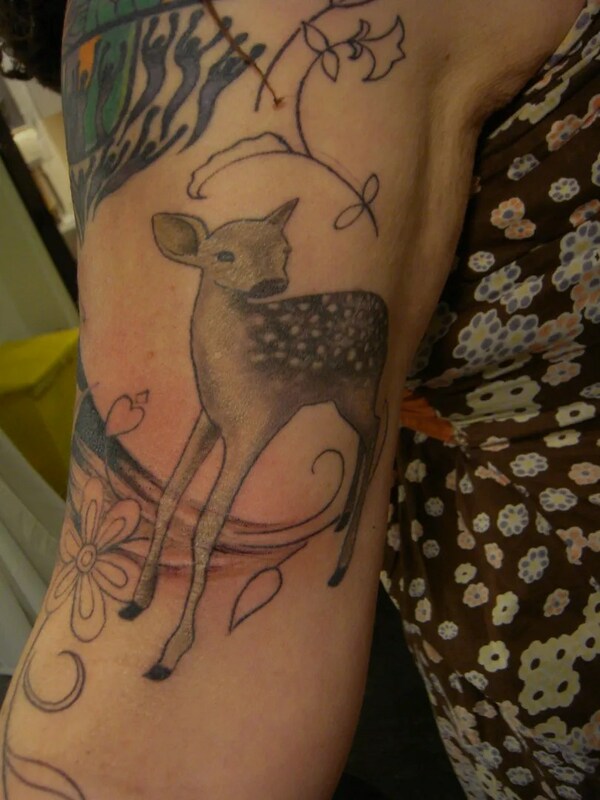 I’m selling charity Christmas cards this year! 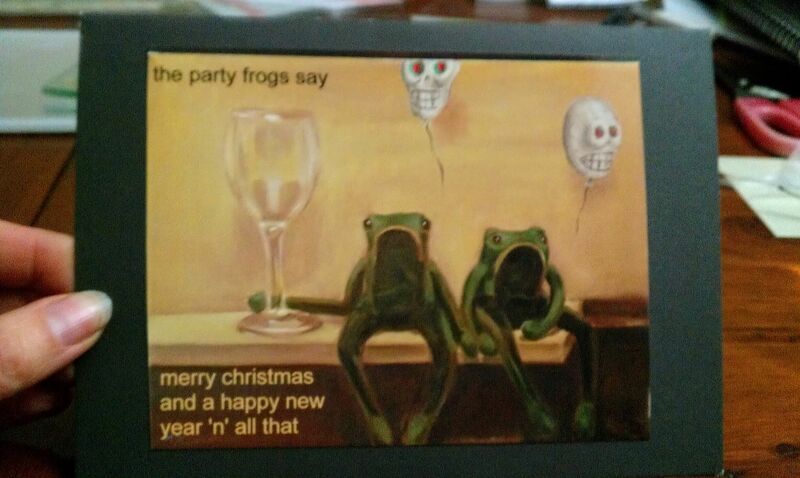 I’ve taken my painting ‘The Party Frogs’ which hangs in Tribe 2, and made cards of it. 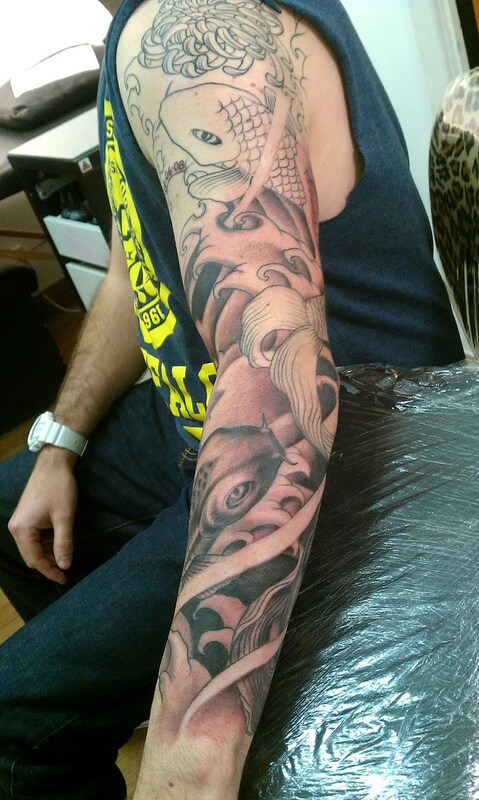 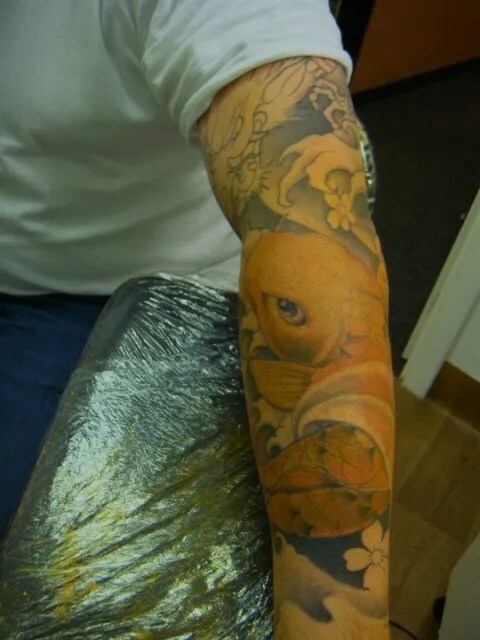 on the following wednesday I had a day of koi and water, Scott had a short session to make a start on the shading of his big koi,it’s going to be a dark one. 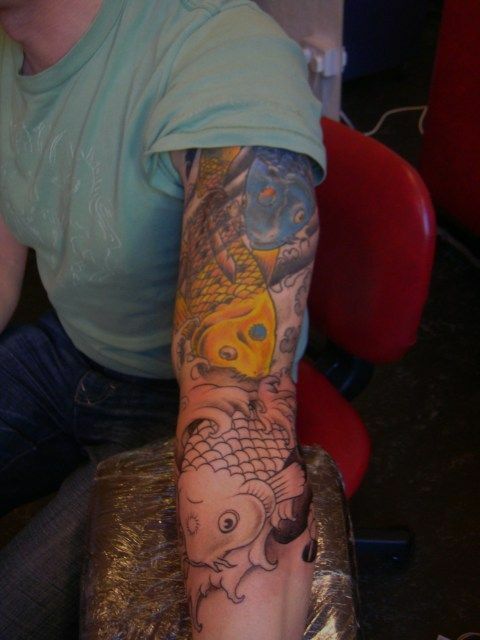 Bryan can’t come in very often due to his work offshore, so we had a good long session booked to try and get it all done. 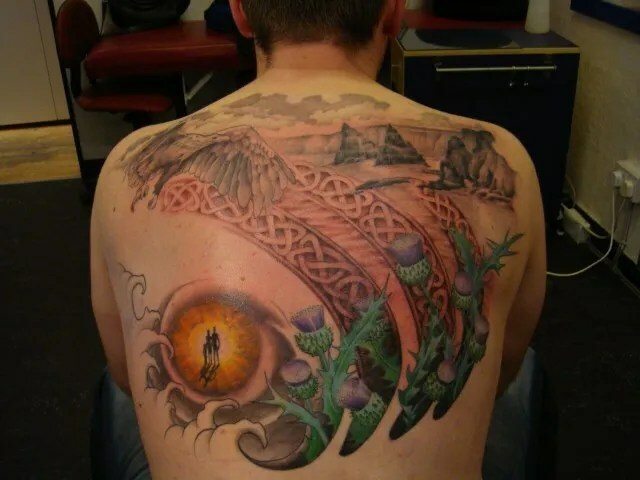 that would have happened, too, except that traffic in Edinburgh is so bloody bad, that he ended up being an hour late for his appointment. 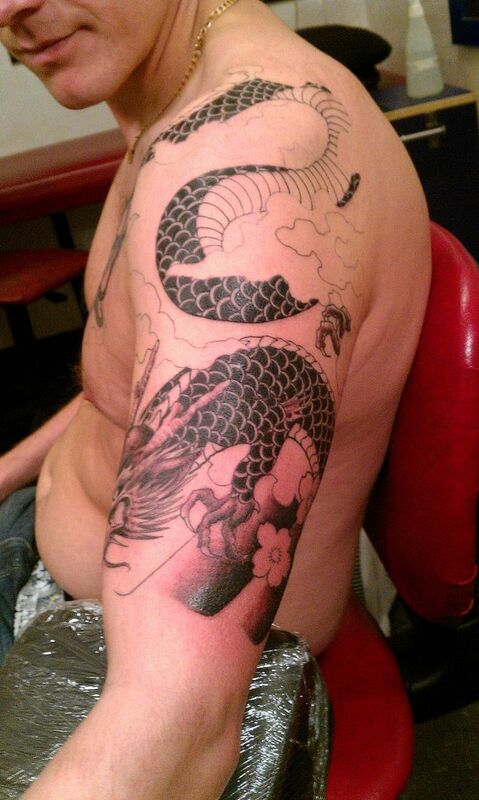 We will have to find another hour somewhere that suits him, so close, but yet so far! we are working around an old tribal piece, and to distract from it, we went for nice bold flowers in bright colours around it to help draw the eye away from it. 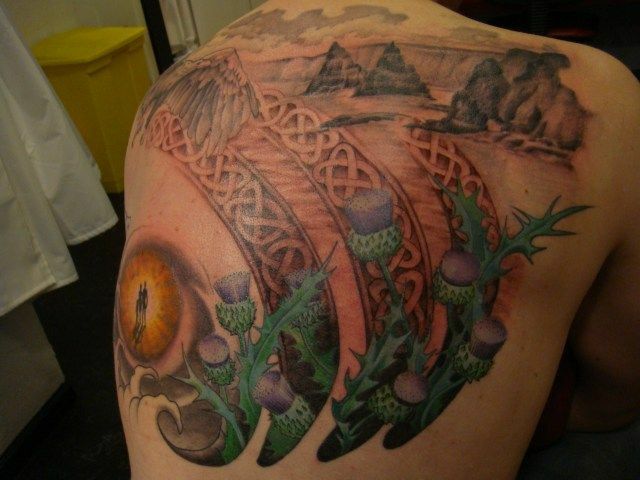 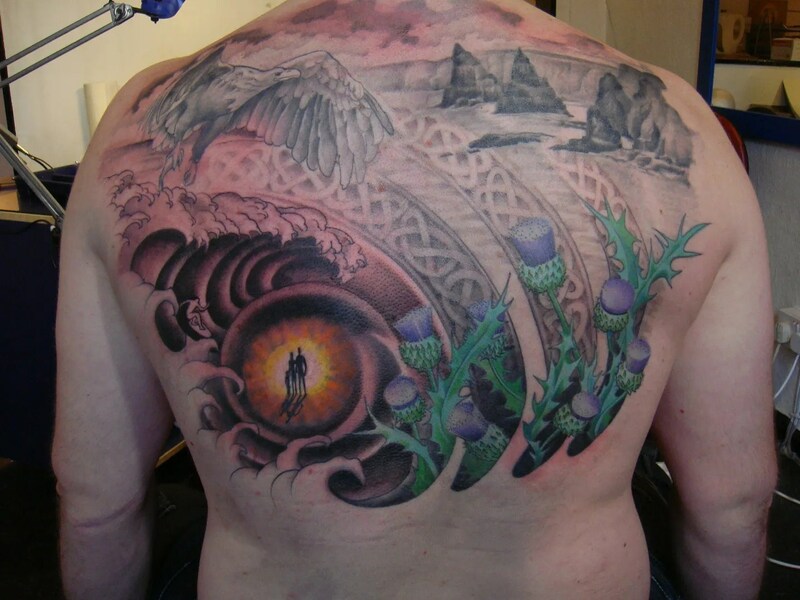 Bluury picture alert…..
in Glasgow the next day i had poor john in for an extended session on his ribs, I think I nearly broke the poor man with this one. 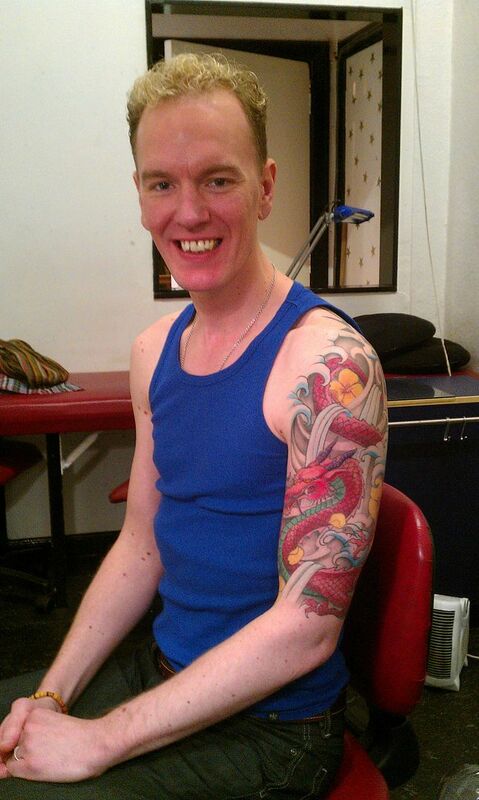 He definitely wasn’t his usual chatty self! 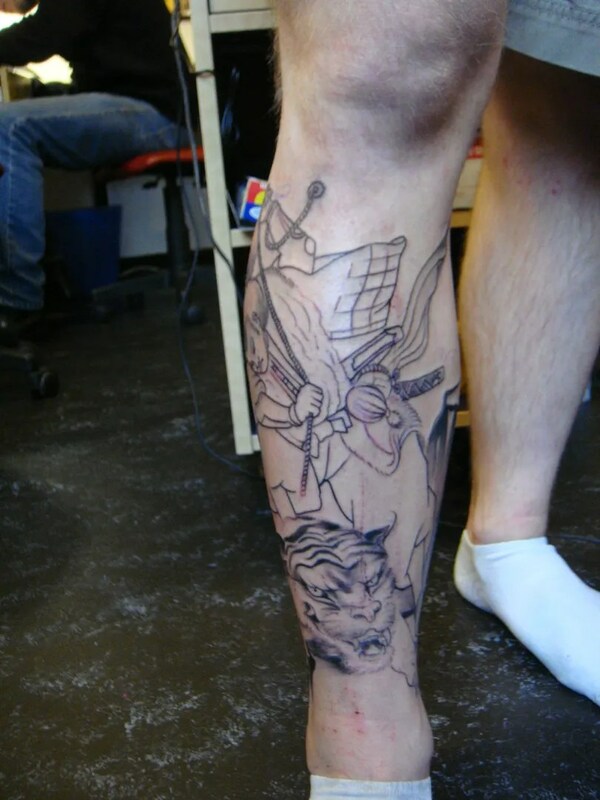 He’s a big boy now! 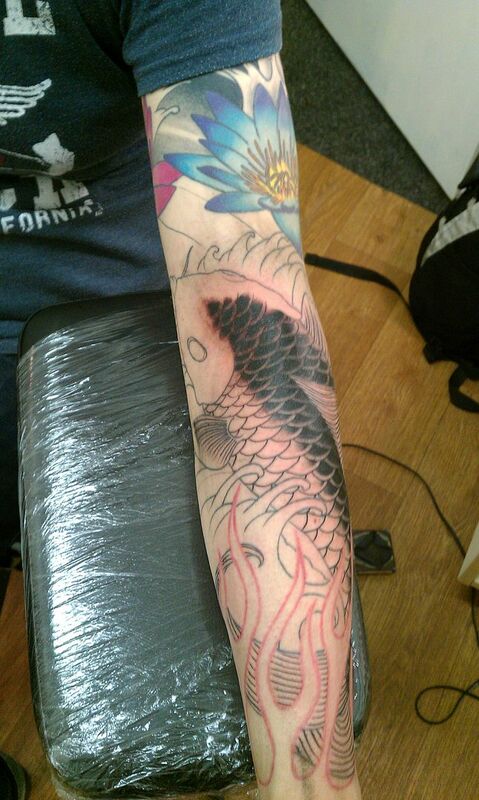 Grant’s koi and hanya mask is getting some colour. 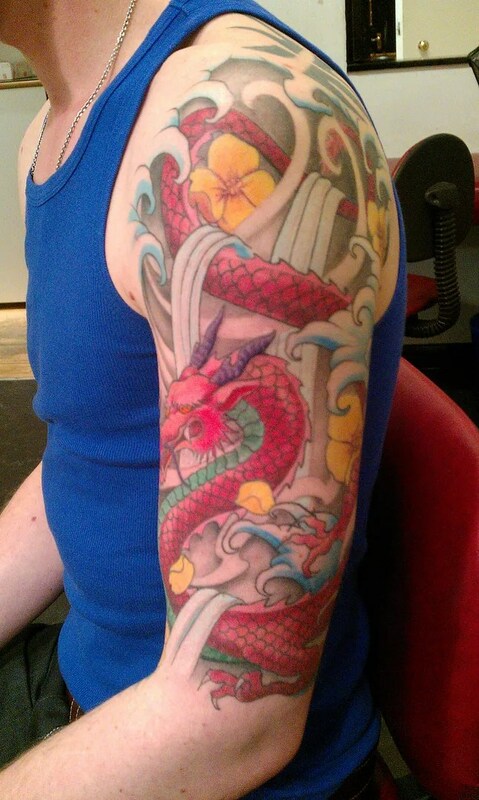 Poor Grant got shivvery and unwell at the end of his long session. 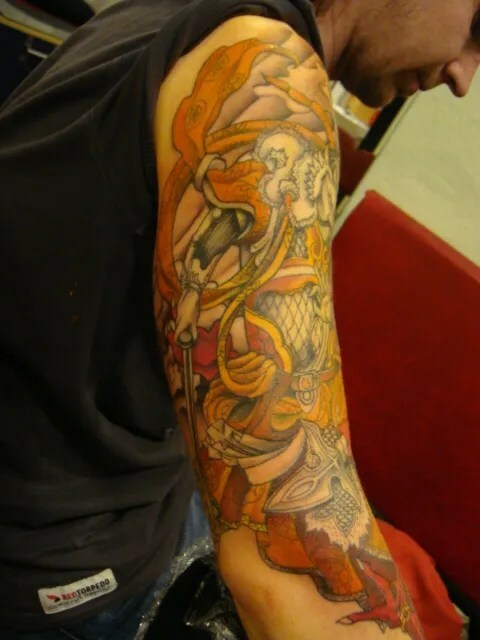 A bit of shivveriness is normal, but grant’s reaction took us by surprise. 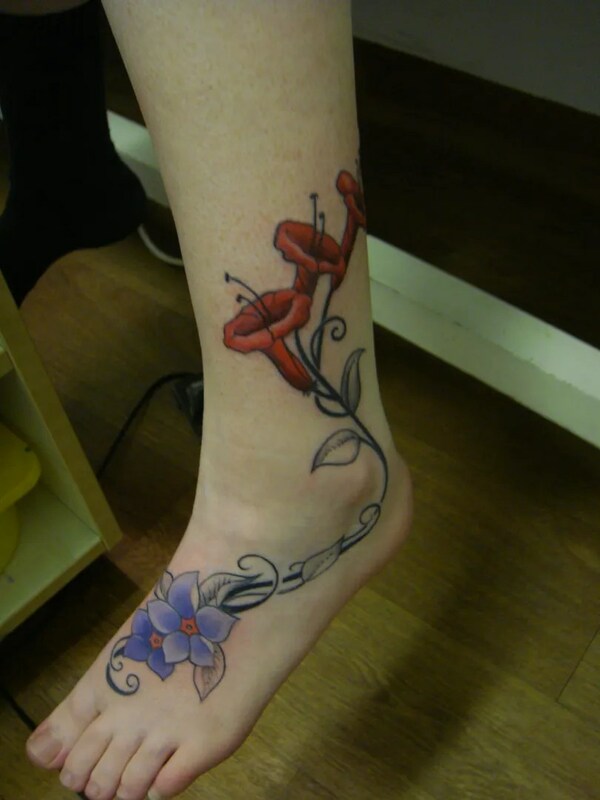 It’s a case of the body relaxing after the tension of getting the pain. 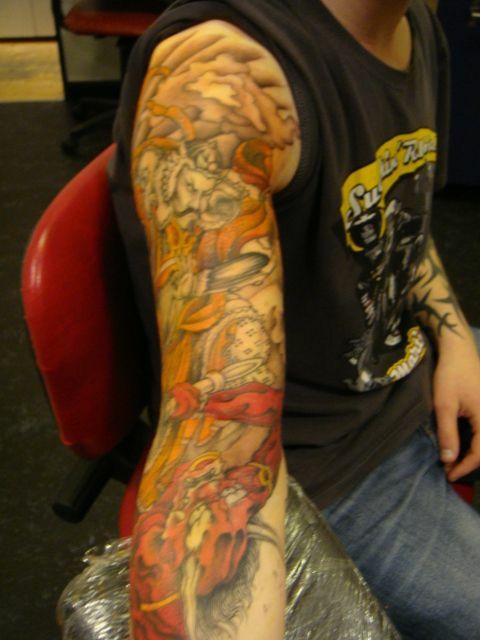 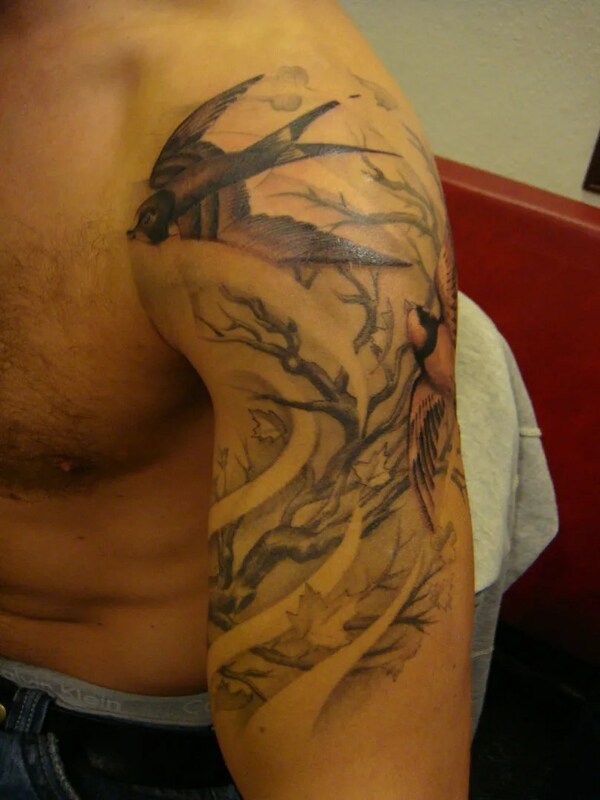 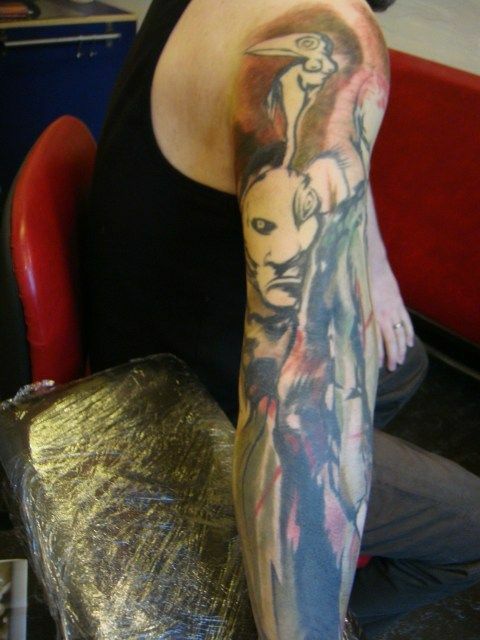 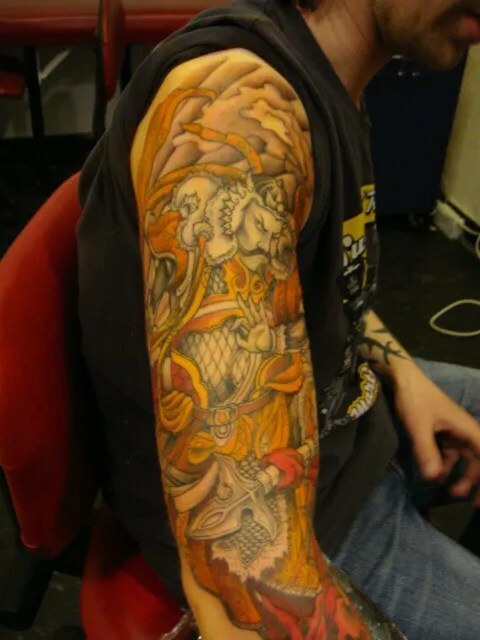 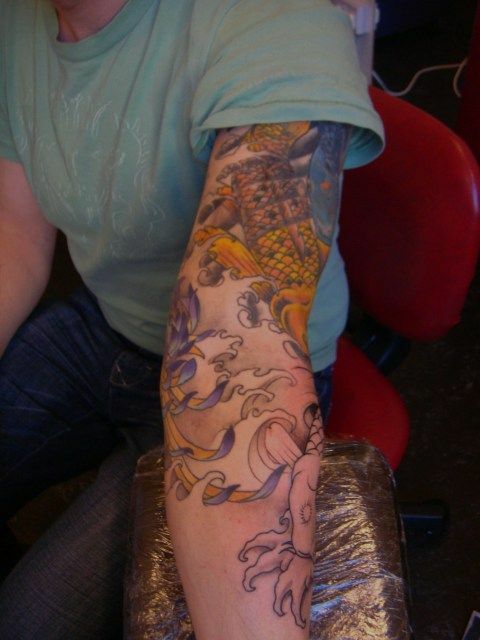 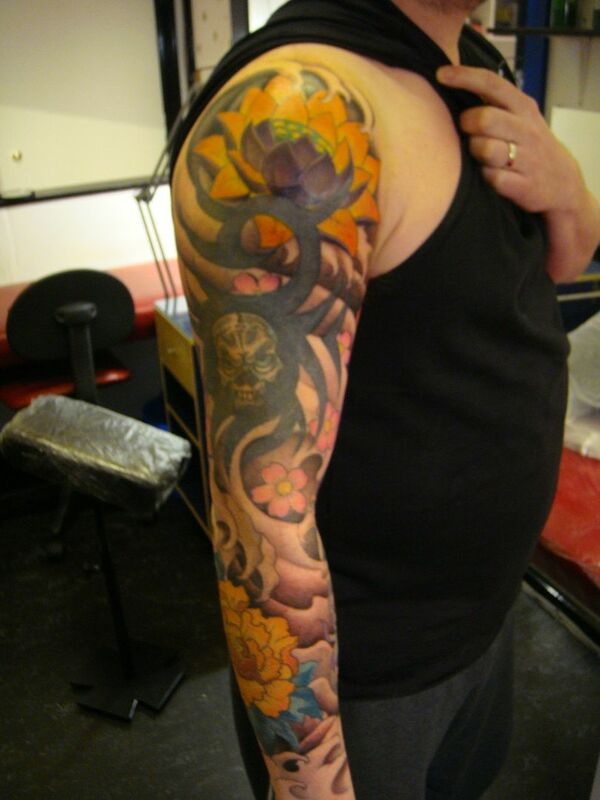 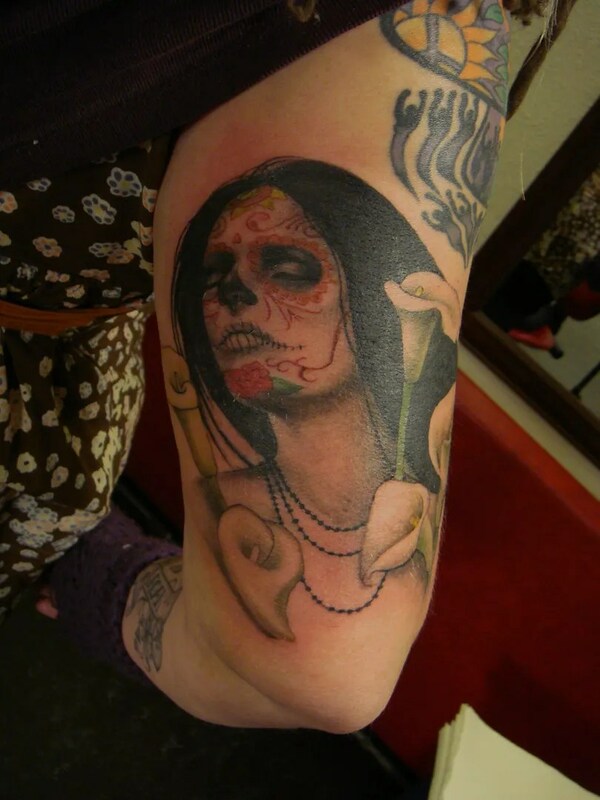 Steven’s piece is a painting by Clive Barker, adapted slightly to fit it on his arm as a sleeve. 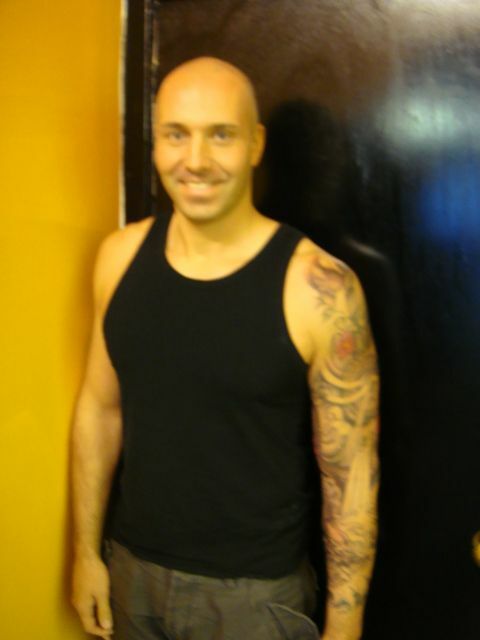 Somehow I’ve managed to make Alan look small, he is a tall man! 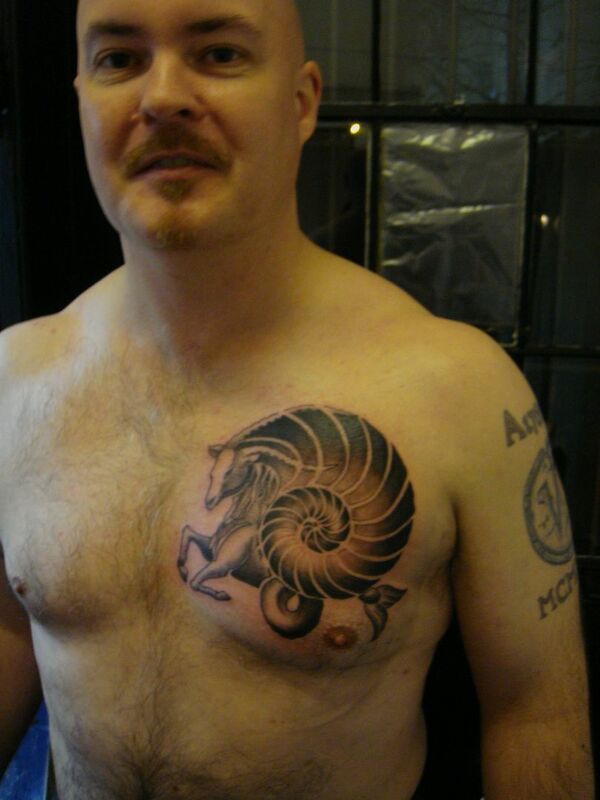 It’s some sort of optical illusion!